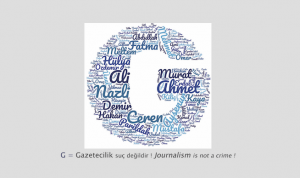 UPDATE (29-01-2019) : Ayşe Düzkan and four other journalist were sentenced to prison because of participating in the “Editor-in-Chief on Duty” campaign with the now-closed Özgür Gündem newspaper. 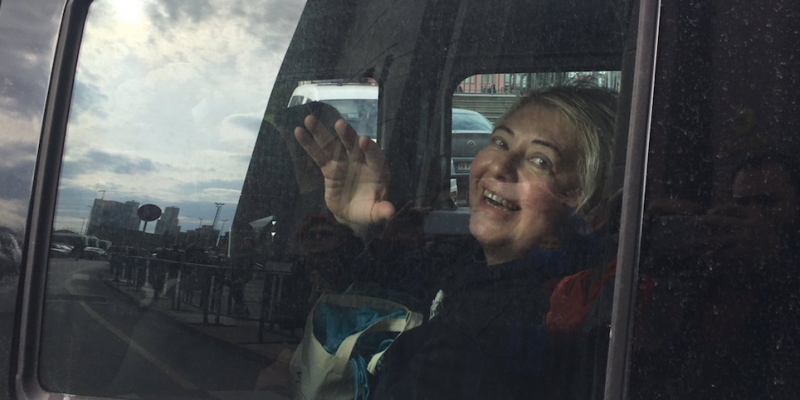 Today, Ayşe Düzkan went to the prosecution office and was sent to Bakırköy prison. Her friends, her colleagues and also DİSK Basın İş members were with her. She was sentenced to 1 year and 6 months in prison. But it is not certain how much time she will stay in prison yet. 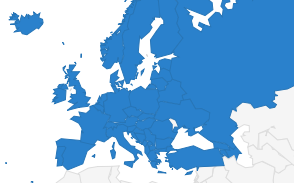 The European Federation of Journalists (EFJ) is calling the Turkish authorities to immediately release Ayse and the other journalists sentenced in the framework of the solidarity campaign with a newspaper. The first hearing at Istanbul court of justice was this morning (20/09/2016) against journalists Ayse Düzkan, Ragip Duran, Hüseyin Akyol and Inan Kizilkaya. The four journalists are being prosecuted for participating in a solidarity campaign with the Kurdish daily newspaper Özgür Gündem. After 20 minutes hearing, the judges decided to merge this case with 20 other similar cases and to resume the hearing on 15th December 2016. Before the case started, supporters gathered outside the court house to make public statements. The EFJ-IFJ representatives, Barry White and Mehmet Koksal, were present along with DISK Basin-Is members (journalists union), TGS members (journalists’ union), TGC (journalists’ association) representatives, Kurdish journalists, members of Turkish Parliament, members of DISK-confederation of workers associations, feminists activists and friends. During the hearing, Ayse Düzkan said : “Yes, I acted as editor-in-chief of the day for Özgür Gündem newspaper. I did it as an act of solidarity with a newspaper to defend press freedom, freedom of expression and to support the public’s right to information. I don’t consider that a crime, I shouldn’t be prosecuted for it and I’m asking all the charges to be dropped”. Arrested by “heavily armed special police officers” on 16th of August, Inan Kizilkaya – flanked by two security staff – read a written statement where he said that “the office of our newspaper Özgür Gündem has been shut down since then and we don’t have access to the building, to the files and to our belongings. I’m now kept in isolation with very limited access to my lawyers and to my family and friends. We didn’t get any document from the prosecution, nor could properly prepare my defence. All our work is related to journalism and freedom of expression and I don’t consider it a criminal activity”. Asked by a local reporter why he was here, Barry White, IFJ-EFJ representative, replied : “Every trial against a journalist is important and we are here to express the solidarity of the international community for all our colleagues who are on trial for only doing their jobs. The situation is worse now than before 15th July because of the massive purges undertaken by the authorities. 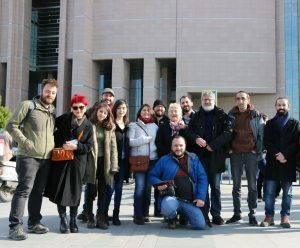 But the level of support shown this morning to the defendants shows the strong spirit of those defending press freedom and the public’s right to information”. 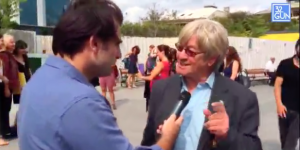 In an interview with journalist Hilmi Hacaloglu (32.gün), Barry White added “the situation is far worse than it was before the 15th of July. Before the coup attempt, we had around 40 journalists in jail the number was decreasing but now we have more journalists being prosecuted, forced to attend court hearings or being arrested. The coup d’état was fortunately defeated, so is the democracy being defeated by the actions of the government against not only critical journalists but all the people in the society thinking differently. They are losing their jobs because of the purge. When we look to this country from outside, we see very courageous people like this morning who came here to support the defendants. What I also see is a growing pressure on the civil society and limitation of freedoms and this is not only against journalists but journalism plays here an important role because people got access to information through journalism. Judges and teachers have also been attacked. To me, if that was happening to my country, it will signal the end of democracy”. Only a limited number of supporters were allowed access to the court room. On leaving the court, the defendants were greeted by dozens of supporters who were unable to get into the court. Local TV and news agencies were reporting the case live from the court. After the court case, the EFJ-IFJ-TGS delegation made a solidarity visit to Evrensel newspaper. This left-wing Turkish daily newspaper has been recently under heavy media attacks from other pro-governmental news organisations. 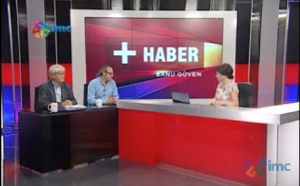 Fatih Polat, editor-in-chief of Evrensel, shared concrete examples of different types threats (jailing correspondents in Mardin and Diyarbakir, pressure on advertisers, penalties from regulators) received by the newspaper and explained the importance of international solidarity to put pressure on the authorities. 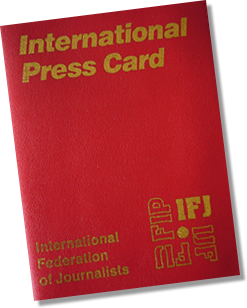 He specifically thanked the EFJ-IFJ and other media organisations in Europe for sending letters to Turkish authorities which helped to release two Evrensel correspondents taken into custody for over 15 days. “Being able to free press correspondents working in Kurdish regions under the current state of emergency situation is really a big achievement !”, he added. 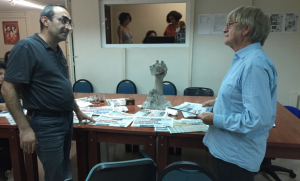 Fatih Polat and Barry White discussed current events in the main newsroom of Evrensel where a symbolic statue, to pay tribute to the memory of the late journalist and press photographer Metin Göktepe, killed in 1996 by police officers, is exposed. “Wherever we go, Metin stays with us”, said the editor-in-chief. The same day, Barry White (EFJ-IFJ) and Ugur Güç (TGS) were guest-speakers at the evening news show with Banu Güven on IMC TV. They discussed the upcoming heavy calender of prosecutions against journalists in Turkey. Responding to the questions of the anchorwoman, Barry White explained that “one of the strategy is to put pressure on European decision-makers about press freedom violations in Turkey in order to force them to be more active on this issue” and added that the EFJ-IFJ will continue its solidarity campaign for journalists in Turkey and ways to improve the situation in order to guarantee public’s right to information.